Those of us who grew up with a console in the house have been conditioned in the way we approach the medium. We often see our games in terms of winning and losing: did you beat that level, did you get the high score, is this armor better than that armor, etc. And while these types of experiences are great for some, every now and then you want something quieter; more gentle. "We find that kids often do better with GNOG than adults," developer KO-OP Mode told me at PAX East 2017. Adults are focused on "winning," whereas children focus on simply being in the space and playing with the tools GNOG gives them. Each "stage" in GNOG is a giant toy head, inspired by the likes of Mighty Max and Polly Pocket playsets. These stylized figures are meant to be poked and prodded, with each press of a button or flip of a switch producing a colorful result. For example, you might be presented with what appears to be a broken-down spaceship, with two astronauts stranded inside. Spin the cranks, pull the levers, and push the right buttons though, and you'll restock their intergalactic ride with food, repair cracks in the hull, and fire up the engines. 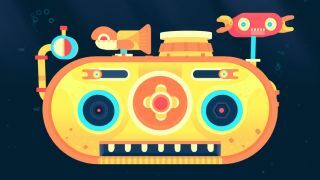 There most definitely is an end goal here - the rescue of the astronauts and completion of their mission - but GNOG never pushes or guides your hand. Reaching the end goal is only as important as you make it, with most of the fun coming from the relaxing exploration of each playset. These are meant to be digital toys after all, and you don't "beat" toys. The easiest way to describe Donut County is "reverse Katamari." Instead of rolling up knick-knacks, people, and eventually whole cities as in Bandai Namco's wonderfully weird PS2 game, Donut County has you control a small hole in the ground, trying to rid each stage of its clutter. Each item that falls into the hole makes it bigger, until eventually it can swallow entire landscapes. Donut County does share a few attributes with the Katamari games though; namely, its catchy soundtrack, playful art style, and embrace of the weird. The residents of the titular county are all anthropomorphized animals drawn in a style reminiscent of Animal Crossing and Night in the Woods. And, like the Katamari series, there is a story to be found here - it just takes a backseat to the experience of being a sentient hole in the ground. While there's no high scores, time limits, or other traditional video game trappings, there are puzzles to be solved. In one level, you might need to swallow a furnace so that the rising heat can cause a hot-air balloon to lift off. In another, you might use a snake's tail to press a button that blows a horn that scares a chicken down from its roost. Why are you doing this? What is the deal with those raccoons on a scooter? Who knows, just enjoy the simple pleasure of knocking things into a hole and relax. Despite sharing a name with a 1987 sci-fi film, InnerSpace is not about a fantastic voyage through the human body. Instead, the game puts you in control of the Cartographer, a small drone created by an archaeologist. Your job is to explore strange worlds designed as inverted spheres. Worlds where, instead of gravity pulling us toward the center of the Earth with the sky above us, the reverse is true: landscapes surround you on all sides, with air in the center and gravity pushing outward. It's just familiar enough to be comfortable, and just strange enough to feel like a vacation to a wondrous fantasy land. As a weaponless drone, your job is not to fight or destroy, but to explore and learn. You can interact with the world by using the blades on your wings to cut ropes or transform into a submarine and dive into the ocean, but throughout it all there's a calm sensibility. The sensation of flight is palpable and freeing, and developer Polyknight Games promises loads of collectibles and secrets to discover. But no matter what you do in InnerSpace, you can't help but take note of its unique art design, which is achieved by the game's lack of textures. Rather than rely on intricately detailed renderings, the game's shadows and perceived details are created by a plethora of shaders and lighting tricks. The result is one of the most beautiful - if minimalist - games you're likely to ever play. Like the other games on this list, SoundSelf will put you into a state of relaxation and calm, letting your mind wander away from the stress and awfulness that can plague modern existence. Unlike the other games on this list, SoundSelf is explicitly designed as a meditation aid - so much so that it barely qualifies as a game at all. SoundSelf is a virtual reality game that fills your screen with geometric shapes, ripples, distortions, and a rainbow of colors. As you use a microphone to hum from deep, deep within your chest, the audio feeds back to your ears and causes the shapes you view to change. It's like turning your vision into a kaleidoscope, controlled by your voice, and the longer and deeper you "omm," the more potent the visuals.